Fresh Crème Ancienne Supreme Face Serum, 1.0 oz. 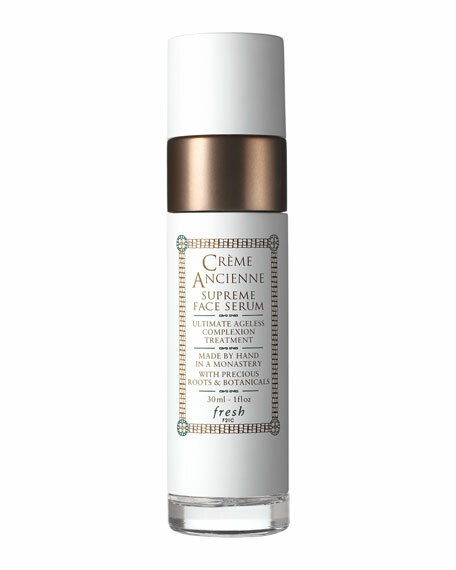 FreshCrème Ancienne Supreme Face Serum, 1.0 oz. Fresh Crème Ancienne Supreme Face Serum is a highly effective formula crafted with exotic root extracts and botanical extracts historically used by apothecaries for their natural powers. Handmade in a monastery to preserve these precious ingredients, the blend combats signs of aging while protecting against future damage and is proven to smooth the appearance of wrinkles, improve elasticity, enhance luminosity, and provide 24-hour hydration* for the ultimate ageless complexion. Galanga leaf extract helps to boost moisture, enhance suppleness, and smooth the skin. Red ginger root extract helps to calm and soothe the skin, and ginger water helps boost hydration levels. San Chi root extract helps to firm, revitalize, and comfort the skin. Ginseng root extract helps to nourish and tone, and ginger extract helps to firm and protect. Echinacea extract helps to improve the skin's resilience to environmental aggressors. Nyamplung and meadowfoam seed oils help nourish, moisturize, and soften the skin.